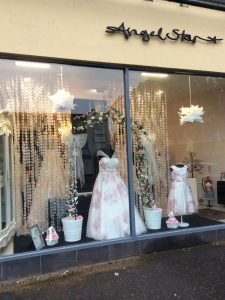 At AngelStar Bridal, we are all about making your dream dress become a reality. We are a team of highly experienced bridal consultants with over 60 years of experience in the business. We have dresses and accessories sourced from around the Globe, so we are sure there will be something to suit all tastes and budgets. We’re passionate about our brands, dresses and bride-to-be's. You’ll find our hearts right on our sleeves & we can't wait to meet you. We’re all on the same page, thus we enjoy collaborating, challenging & supporting each other. We celebrate the uniqueness in others so we cater to brides of every shape & size. We have a dress to fit you perfectly. We’re in the business of celebration and joy so it starts with our team. From the moment you meet us our infectious attitude & love for all things wedding will be apparent. We are open & transparent with our ideas, goals, and actions. We seek to convey our thoughts in a genuine way to make sure your dress and experience are second to none. We strive for an environment that showcases you & your dress fitting in a relaxed, warm atmosphere. We dont rush you at all & are only involved in your experience as much as you want.